Meaning of name: Uncle (in Indonesian language). 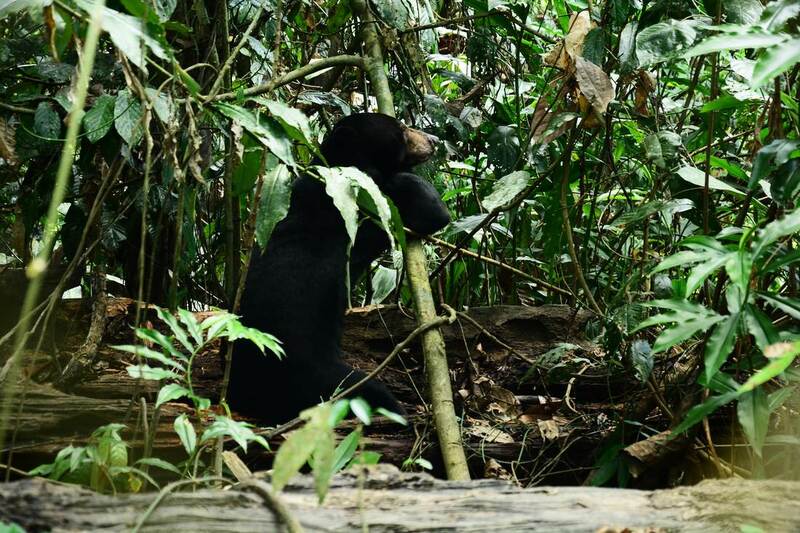 History: Om came from a plantation in Telupid in August 2005, when he was only 5 months old (most sun bear cubs stay with their mothers until they are 2 years old and can then live independently). Personality: Om is a very energetic and imaginative bear. He is a bear who enjoys his food. Om spends a good deal of his time in the forest. When going out to the forest, he uses his natural instincts to explore, forage and dig for food. With his strong canines, Om will tear apart dead wood to extract honey bees! He often stays on the ground and does not yet climb trees. Sometimes he is quite content playing by himself, especially with small pieces of dead wood – he has a way of levering a thick stick under his thigh with one arm, and uses the other arm to send it flying at high speed. Om adapted well to his new life of freedom. Identifying Mark or trait: Om is missing his left front claw, which for a human would be his left hand little finger. Adoption: Om was adopted by Amy Scott through the My Bear Adoption Programme.